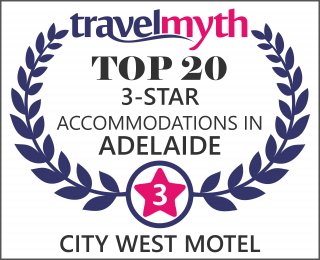 City West Motel Adelaide is located on the city edge thus within easy access to all major parts of Adelaide. Why not enjoy this ideal location which is close to Adelaide airport (7 mins) and near Adelaide city centre with public transport just steps from our front door. Centrally located to all renowned tourist attractions and amenities. Whether your interests lie in the arts, wineries, theatre, sports or a lazy day at the beach, City West Motel Adelaide is a centrally located, budget priced, clean comfortable accommodation hence perfectly suited. As a family owned and operated business we can assure you of the standard of our rooms and quality of service. A quick 5 min drive, taxi or bus ride will have you in the centre of our city and all the attractions it has to offer. The Rundle Mall shopping precinct, Clipsal 500 race track, Adelaide Zoo and much more are all nearby. A quick bus ride can have you to our lovely beaches and the Glenelg precinct, Adelaide airport, Adelaide Parklands and Keswick Rail terminal. At City West Motel Adelaidewe are committed to friendly and Professional service, while you enjoy our comfortable and well appointed rooms. Ideal for those who enjoy the qualities of our home away from home atmosphere, while providing the service needed by the visiting business man. Walk to bus stops to city and return and all the features that the local area has to offer. Thebarton theatre is a minute walk, restaurants, pubs and takeaway food stores, cafes and all the shopping you could want, right at your doorstep. A bus hop to the beach. Major sporting arenas, Santos stadium, ETSA Park and Hindmarsh Stadium are just minutes away. If it’s entertainment you want, local pubs with entertainment or a concert at the Entertainment Centre all close by. A five minute car ride will have you enjoying in the Tour Down Under, Clipsal 500, Adelaide Fringe Festival, shopping in Rundle Mall, the Adelaide Central Markets. You can see shows at the Adelaide Festival Theatre, play at the Adelaide Casino or dine at Adelaide’s finest restaurants. All are just a few minutes away.